Durante sus 60 anos como pastor, John Osteen combino su extraordinario amor por la gente con una vision de ministerio que el describia mejor que nadie: "Sin limite". Esta edicion no solo incluye parte de los sermones escritos por John, sino tambien un prefacio y comentarios de su hijo, Joel; los principios de esta fe "sin limites" vienen a acompanar a una nueva generacion. Para esos momentos de luchas y tentaciones que todos enfrentamos, esos momentos en que nos sentimos rodeados y atacados, el mensaje de John es sumamente simple -esos son precisamente los momentos para una fe inquebrantable. 1. Escucha y observa lo que el mundo no puede ver ni escuchar. 2. Ora fervientemente aunque ya hayas conseguido una respuesta. 3. Es mas firme cuando no hay senales de la respuesta. 4. Siempre dice: "!Vamos de nuevo!". 5. Sigue adelante aunque las senales de respuesta sean minimas. 6. Cree en grande aunque parezca poco. 7. Empieza de la nada y termina haciendo cosas impresionantes por Dios. 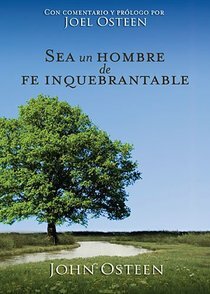 About "Sea Un Hombre De Fe Inquebrantable (Becoming A Man Of Unwavering Faith)"
John Osteen (1921-1999) was born in Paris, Texas in 1921. He was ordained as a Southern Baptist minister just before his 18th birthday. From 1949, Osteen was pastor at Central Baptist Church, Baytown, Texas, and during that time divorced his first wife, Emma Jean Shaffer. He married Dolores "Dodie" Pilgrim in 1954, and the following year resigned his pastorate. Osteen re-entered pastoral ministry at Hibbard Memorial Baptist Church, Houston, Texas, but left in 1958. After undergoing 'baptism in the Holy Spirit' in 1959, Osteen founded Lakewood Church in an abandoned feed store in Houston, Texas. The membership of this phenomenally successful charismatic church would eventually grow to 15,000. For many years, John Osteen encouraged his son Joel to preach, but Joel always declined, preferring to work behind the scenes. However, in early 1999 Joel felt compelled to accept his father's invitation and he preached his first sermon on January 17th of that year. Little did anyone know that would be the last Sunday of John Osteen's life - he died suddenly of a heart attack at age 77. Two weeks later, Joel began preaching regularly and later that year was installed as the new Senior Pastor of Lakewood Church.